Why are people interested in population now ? When change happens slowly people are less likely to notice but as it speeds up they do. Older people will notice change more as they have a longer perspective. Melbourne’s’ population is now growing by about 100,000 per year. 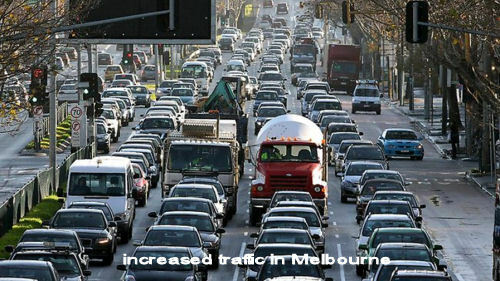 Melbourne’s cars also increase by about 100,000 per year. In the year 2014-5 when Melbourne’s population grew by 91,600 or 2.1%, Hobart’s population grew by 1,700 or 0.8%. Population growth thus would not be noticed nearly as much there where growth is so much slower and from a much smaller base, so smaller numbers are added. We all now realise that Melbourne’s population is growing very fast. In the last 20 years the subject of population growth has gone from a hidden topic to one that has constant exposure. In fact there is little on the news and radio programs that does not relate to our city as a fast growing place. What sorts of things are mentioned in the media? Traffic, planning issues, public transport – e.g. 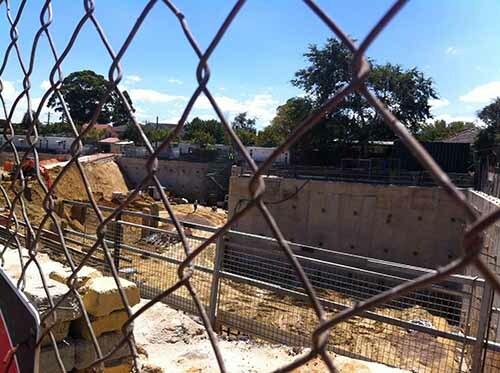 Railway crossing elimination, new underground and the tension this causes with those who want to protect the trees; suburban sprawl , housing affordability, pressure on schools , medical services, etc. Less often now – but still relevant – water, wild life, environment. In the city and suburbs changes can be seen in the very physical nature of the city. They directly affect us. What do we observe in our daily lives? 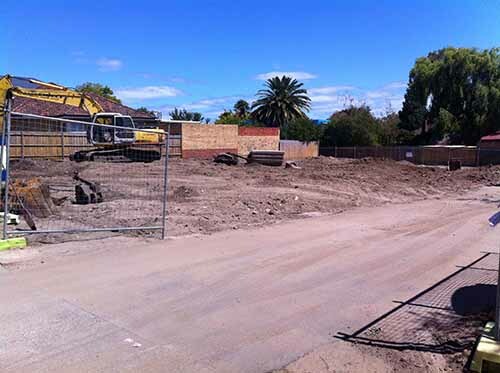 In established inner and middle suburbs of Melbourne one sees changes, which are usually to accommodate more people per unit of land. We see demolitions of houses to make way for much denser living arrangements. Residents capitalize by clubbing together to sell a few houses in one street so that higher density accommodation can be built and a larger profit made from the land. It would not be possible for such profits to be made if the population were not rising rapidly. It is population pressure on limited land that causes this phenomenon. Such actions are actually extremely anti-social as they mean doing a dis-service to one’s neighbours and then disappearing! 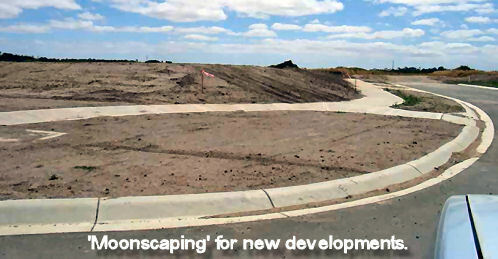 For those who live further out especially in areas known as “growth corridors", they observe new roads being built, farms being sold, market gardens disappearing, trees and natural areas, wild life habitat being sacrificed. We are all aware of increased traffic , pressure on house prices and affordability problems, pressure on services such as hospitals and schools, greater regulation, particularly parking. Why is Melbourne’s population growing so fast? 1. Overseas immigration has increased significantly since the 1990s. 2. The population tends to congregate in the capital cities despite Australia’s “boundless plains”. At one stage, during the mining boom, Perth was the fastest growing city in Australia and at another stage it was Sydney. Now Melbourne takes the dubious prize. Since Premier Jeff Kennett's election, Melbourne has been designated a region in need of migration, making it easier to bring relatives or skilled migrants – however defined – employees of wide variety. 3. In 2017 Melbourne is an economic centre where compared with the country town and regional centres there is more work. In regional Victoria, farms have been vastly mechanized and are increasingly corporatized. It is hard to make a living from a family farm. Costs have ballooned and there is terrific global competition. Unlike in the past, banks are reluctant to finance farms. Bank lending used to be long term – now there are so many competing uses for money – e.g. urban real estate. Agricultural land is only worthwhile on large scale when sold to often foreign interests. 4. There is a world- wide drift of population to the cities. 5. This means that migrants to Australia also gravitate to the major cities, especially Melbourne. This has driven up the price of land in those cities. It is self-perpetuating as it encourages speculation and land and property banking in a vicious circle of land value inflation. You can read Melbourne's population growth almost as Victoria’s population growth and the larger part, over half of this growth, is from overseas migration. Is there any problem with the current rate of population growth in Australia? Australia is a large land mass, but if you look out of the window of the plane next time you fly over it, you will see that the vastness of Australia is a desert. It is never going to be settled in the way that, for instance, France is, with small and medium sized cities as well as villages all over the country. The US is also settled quite differently from Australia, with many medium sized cities all over. In Australia we hug the coast. The present population of Australia is distributed similarly over the continent to the way the Australian Aborigines settled. A very recent genetic study by a group associated with La Trobe University shows that about 50,000 years ago the Aboriginal people arrived and settled very quickly all over the continent in stable communities. In the late 18th century, Europeans didn’t colonize a vast uninhabited land nor even, it would appear, a land of nomads, but rather, they displaced those who already lived here. What is now Melbourne was an attractive place for the Aborigines and also to the first European settlers. From first hand reports, the area consisted of wetlands teeming with wildlife, set on a shallow bay that we know as Port Phillip Bay. The local Aboriginal population availed themselves of the rich natural offerings. Estimates of the Aboriginal population vary and are probably often under-estimated. The most plausible estimate I have seen with respect to the Aboriginal population in Australia wide is by a Dr. Jim Poulter at about 3 million and 20,000 in the “Melbourne” area. You can find the reference at https://candobetter.net/node/3720. Europeans first settled in “Melbourne” in the 1830s, starting as a tent city. It was the nation’s capital city from 1901 to 1927 and reached a population of 1 million in 1930 - that is, in under 100 years. Melbourne is now a city of 4.5 million and projected to grow to about 8 million by mid –century. Is there any problem about Melbourne growing to 8 million and beyond? Is it inevitable? Australian State of the Environment 2016 (just released). 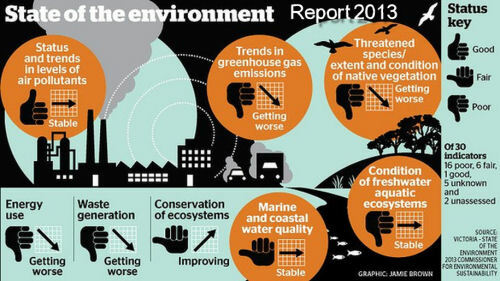 “In the past 5 years (2011–16), environmental policies and management practices in Australia have achieved improvements in the state and trends of parts of the Australian environment. Australia’s built environment, natural and cultural heritage, and marine and Antarctic environments are generally in good condition. The picture that emerges from these reports is to me alarming and should trigger and change in direction but we are not seeing this. From the point of view of fresh food for Melbourne’s’ population there is a collision of population growth with what sustains it. “Dr Rachel Carey Research Fellow in Food Policy and Sustainable Food Systems, University of Melbourne, advises that Melbourne’s surrounding Green Wedges currently provide 41% of all our food: 82% of our vegetables, 39% of dairy, 100% of eggs and poultry, 63% of red meat, and 13% of fruit. Dr. Carey has also said we need to double our food production by 2050 under the current population growth trajectory." How are we accommodating the rising population? 2.Urban consolidation or densification in established suburbs. This is a highly energy consuming process of demolitions, major earthworks, reduction of permeable surfaces, and removal of vegetation including large trees. It is extremely disruptive whilst it is happening and the result invariably reduces amenity. When you think about it you cannot increase the height of a building with no change to set backs without negatively impacting on a neighbour's sunlight. Just a seemingly small increase in heights can reduce winter sun and increase power bills. What happens to the effectiveness of your solar panels if they are overshadowed? What happens to infrastructure in the area when population is thus increased? At the same time the increased ratio of concrete to vegetation increases the “urban heat island” effect. At the extreme end, high rise towers, housing hundreds of extra people and cars dramatically change the traffic volumes and visual character of the area from which they can be seen. “The obvious strategy to reduce pressure in Greater Melbourne is to develop the regions” - Tim Smith, opposition spokesman on population pushing the idea of channeling population to the regions, such as Ballarat and Geelong. But to put numbers in perspective, Victoria’s population grew by 123,000 last year. That’s a city the size of between Ballarat and Geelong. The Victorian Government's "Plan Melbourne refresh" places the emphasis is on making existing Melbourne suburbs accommodate around 70% of population growth. They have said they will “save the backyard” but what will it be overshadowed with?. There are very dramatic changes over a very short time span. When did people start to become interested in the topic of population growth in Melbourne? Former Premier, Steve Bracks even told the people of Melbourne on ABC radio one morning that Victoria had more deaths than births. In other words, that we had negative natural increase! This was not so. In fact, at the time and right through recent decades, the situation has been the opposite to the tune of about 2 births per 1 death. In the year to June 2002 Melbourne’s population had increased by 51, 478 people to 3,524,103 or by 1.5%. So the population was actually increasing but it was not a big news topic as it is now. The ongoing Victorian figures at that time for natural increase were around 60,000 births and about 30,000 deaths. Anything over this approximately 30,000 natural increase in population was via overseas migration, or interstate migration. Interstate migration though, in recent years, has been a rather insignificant number compared with overseas migration. Components of population growth in Victoria. The population of Melbourne also grows with the movement of people from country to city. Victoria’s population increased by 123,100 to 6,068,000 a growth rate of 2.1% [or a doubling rate of about 33 years]. The number is well over double the increase in 2002. Why? Immigration has increased since 2002. In 2002-3 immigration to Australia was 125,300 and made up 52% of Australia’s population growth. In 2014-5 it was 168,200 but has been as high as 300,000 in the last decade. In 2002 the Labor government’s planning blueprint “Melbourne 2030, planning for sustainable growth” aimed to fit in an extra 1 million people into Melbourne by 2030. Before this blueprint was released, I responded to an invitation to be part of a community consultation process - a felt pen and butcher’s paper exercise. The necessity for the population growth that underpinned it was not questioned or discussed but presented as inevitable. Those who wanted to register their objections were on the whole unable to, as they had to be all sitting at the same table and they had little chance to organise this. Only issues that got a minimum number of votes at any one table were recorded. The option of not to grow the population at the rate assumed was not on offer. The population of Melbourne at the time was 3.5 million and it is now about 4.5 million. Successive Victorian governments have treated rapid population growth as inevitable and beyond their control. They know that unacceptable changes are being made to where we live, making life progressively less pleasant and more difficult. As the ABS figures tell us that the larger part of our population increase each year is from overseas migration, the Victorian government could send signals to the Federal government that the rate of influx is having adverse effects – but they don’t. In fact they do the opposite! 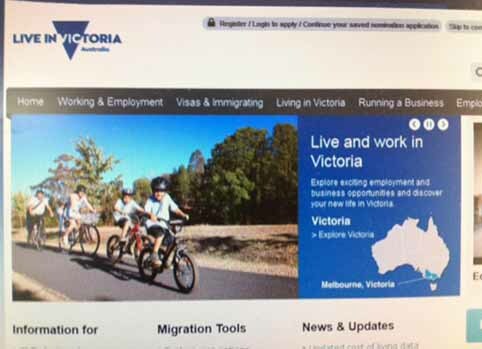 They advertise for people from overseas to come and work in Victoria! In public interactions state governments treat population growth as something they have to deal with and have no power over. 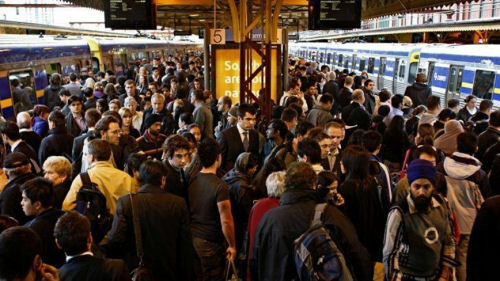 Meantime the Victorian people are inconvenienced as infrastructure and services fall behind population growth. Solving the problems of too rapid population growth is costly with the costs of level-crossing projects, cost of new roads, road maintenance, upgrading of rail systems. Australia has to build the equivalent of a new Canberra each year. We shot past the prediction that Melbourne would have an extra 1 million people by 2030. Now it is predicted to be 8 million by 2050. In the year 2015-2016, Melbourne grew by 2.1% down from 2.2%the previous year. At 2% p.a. and an estimated population of 4.5 million it will be 9 million in 35 years, that is, in 2052. In order NOT be 9 million the growth rate needs to slow. If it remained at 2% p.a. Melbourne's population would double again to 18 million by 2087 and 32 million by 2122. That means that in the next few years people would be born in Melbourne who may see it at 32 million. Our establishment has not conceived of any of this being too much and there is no preparation for it.“Planning” appears to be – smoke and mirrors, tinkering around the edges to create differences in approach between team A and team B to the same problem. Can we change our future? Our future as a city of 8 million by 2050 is not inevitable as we can change this trajectory. If overseas migration were wound back to 1990s levels, of around 70,000 p.a., our growth would slow considerably, but we would still grow. I implied in my title that I would go beyond 2050. 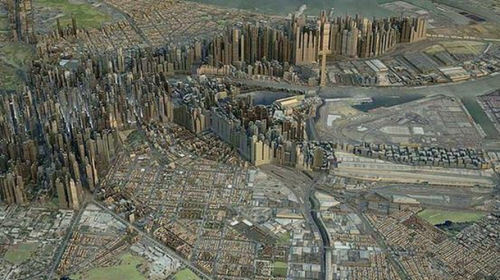 I have vivid images in my mind but Katie Wong Hoy of the Age 30 August 2015 provided an image from Monash Architecture studios of how Melbourne might look accommodating about 8 million stretching out from the CBD. It is based on the footprint of Manhattan. This journalist was looking at Melbourne in 180 years’ time and using a compounding percentage growth of 2.2% (growth rate of Melbourne at the time) reaching an "alarming" (her own words) 228 million in 2195! Difficult as it is to predict the future, I predict that this cannot happen as we would reach ecological collapse long before this. Join a local group. One of the difficulties that constant change causes is that we now have difficulty getting organised to present an alternative, so anything that offers itself as a way to do so is good opportunity - residents’ groups, local conservation groups, join Sustainable Population Australia, Planning Backlash. Make comments or write articles for the alternative media, to open up discussion. Candobetter.net will publish anyone who gives the subject a go and other sites present opportunity for comment or debate. The main thing is to get the alternative to endless growth out there to counter the establishment message. The Age editorial says it all “The Age supports population growth. It is one of the main sources of economic wealth an cultural diversity,......” Populations boosters invariably wouldn’t know the economy if they fell over it and know little of economics (economics of the real world) to boot. The phrase “economic wealth” is double speak for their wealth as The Age’s owner Fairfax is a bit more than a dabbler in the property market and property development. The Age also acknowledges that Australia has an infrastructure deficit and any attempt to rectify that deficit will blow the budgets of all governments out of the water. The question then must be asked: Why is this infrastructure deficit increasing? The answer my friends ain’t blowin’ in the wind, it’s because each time a migrant steps off the plane into the Land of Oz, we cough up $178,000! Yes that’s right, 178,000 Oxford Scholars. This is the cost of adding infrastructure to our cities and towns. This is the cost of adding schools and hospitals, extending utilities, roads and rail, housing that nobody can afford and not being able to maintain what we already have. All this, of course, is at the expense of the environment. Not only are we poorer for the efforts of the population boosters, so too is the biota! I fear that while we have successive governments at all levels that bow down to population boosting, a rapacious bank and housing sector and a compliant media, we may be banging our heads against the proverbial wall. Still we must hang in there as I believe we are slowly getting the message across as more people become aware of the problems that overpopulation promotes. Thank you John, for this comment, which I managed to preserve among a slight decline in spam today with the institution of captchas. Please keep those comments coming. (We have been enduring a massive spam assault and I don't know how many comments we may have lost in the crowd.) As well as Jane O'Sullivan's estimates of dollar costs per immigrant, to which you allude, there are a host of intangibles, which we also need soon to explore again. Such as insecurity, disorganisation, time spent protesting, trying to defend property rights. I'm also thinking of the dual economy where overseas currencies can buy up our property more easily than Oz dollars, exacerbating the rich/poor divide here and its concommitant in multiple house owners vs homeless. People seem to be worrying more about having their homes invaded, houses robbed and crime in general, but when an increasing number of Australians and immigrants have insufficient employment in the mainstream economy, what you have left is the black economy, which power elites are encouraging internationally with wars as well as mass immigration in the still relatively peaceful 'developed world'. So drug cultivation, drug dealing, breaking and entering, reluctant prostitution, murder for hire... We have gone from a country where people literally didn't lock their suburban doors because everyone knew everyone else to one where insurance and security are major employment and investment sectors. This is not "progress". The "growth" addiction is about surrendering to vested interest groups, not general population and voter welfare. Doctors in the medical profession take an oath, the Hippocratic oath, to ensure that their medicines and procedures are for the BENEFIT of the patients, rather than promote diseases! The same sort of oath should be for politicians, that their policies actually BENEFIT the public in general and serve their welfare- and that of future generations. What we have now is they are serving industry groups, such as property developers, banks, "investors", The Economy's growth, but are derelict with environmental standards, human welfare, personal well-being, or any consideration for the future! Policies should benefit the majority, not privileged minorities. There's no public or democratic mandate to keep expanding our cities, or for mass immigration - and even Multiculturalism is wearing thin! It's all about manipulating the public to support high immigration. Economic, legal and social policies all should benefit the majority, not politicians lining the pockets of the elite, and assuming it's all natural! Nothing "natural" about our population boom. Our Constitution needs to be amended so that the public are not manipulated. At the rate we are going, the only home owners will be those inherited from Baby-Boomer parents, or the elite! Living standards are declining, and debts mounting. We lack real leadership in Australia, and the public are too manipulated. An oath that all laws and policies are democratic, and for the benefit of most, should be enshrined in our Constitution.